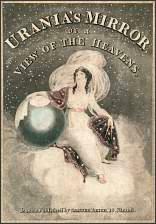 Urania’s Mirror is a boxed set of 32 constellation cards first published by Samuel Leigh of the Strand, London, in November 1824. An advertisement and review in the The London Literary Gazette for 1824 November 27 describes them as “fitted up in an elegant box” and selling for £1 4s black and white or £1 18s “beautifully coloured”. They were described as “An acceptable present” so no doubt the publication was timed to catch the Christmas market. The engraver was Sidney Hall but authorship was coyly attributed to “a lady”. Peter Hingley, former librarian of the Royal Astronomical Society in London, has established that the true author was almost certainly the Reverend Richard Rouse Bloxam (c.1765–1840) of Rugby ( Journal of the British Astronomical Association, vol. 104, p. 238, 1994). There is, though, another possibility not mentioned by Hingley: Bloxham’s wife, Ann (1766–1835), was the sister of Sir Thomas Lawrence the portrait painter, so she might deserve at least a share of the credit as the anonymous “lady”. There seems little doubt that Urania’s Mirror was directly inspired by Alexander Jamieson’s Celestial Atlas published in London two years earlier. A comparison of the two works shows that the constellation figures have been copied almost exactly from Jamieson’s atlas. Urania’s Mirror even adopted two figures newly introduced by Jamieson: Noctua, the owl (Card 32, a replacement for the existing Turdus Solitarius), and Norma Nilotica (Card 26), held by Aquarius, apparently intended as a gauge to measure the annual flooding of the Nile. Perhaps the real reason the author chose to remain nameless was to avoid accusations of plagiarism. It is not known what Jamieson thought of Urania’s Mirror, or if he knew of the Bloxam connection, but by an odd coincidence one of Bloxam’s sons, John Rouse Bloxam, was briefly chaplain and classical master at Jamieson’s private school in Wyke House in 1832. There were two editions of the cards. In the first edition, only the stars in those constellations named on each card’s heading were included, leaving the figures looking sadly isolated as in this example. In the second edition, which followed soon after the appearance of the first, stars were added in the surrounding constellations. It is the second edition that is illustrated here. One attractive feature of the cards is that they were perforated with small holes for each star, to give an impression of the constellation’s appearance when the cards were held up to the light. Doubtless many cards met an untimely end through being held too close to a candle flame. The cards were hand-coloured in water colours. While the colourists followed a general style, presumably laid down by the publishers, every set is slightly different. A book called A Familiar Treatise on Astronomy by Jehoshaphat Aspin was produced specifically to accompany the cards. This book went through four editions, the fourth being published in 1834. In 1832 the cards and book were also published in the United States; a facsimile of the American edition was produced in 2004 by Barnes & Noble. Facsimiles of the cards alone appeared in The Box of Stars published in 1993. Urania’s Mirror features 79 constellations, not all of them still recognized by astronomers, plus three sub-constellations: Caput Medusae (the head of Medusa the Gorgon), seen on Card 6 with Perseus; Mons Maenalus on Card 10 beneath the feet of Böotes; and Cerberus, on Card 11 in the hand of Hercules. The constellation names given in the captions below are as written on the cards themselves. For more about the background to these constellations, both current and obsolete, see my Star Tales pages. 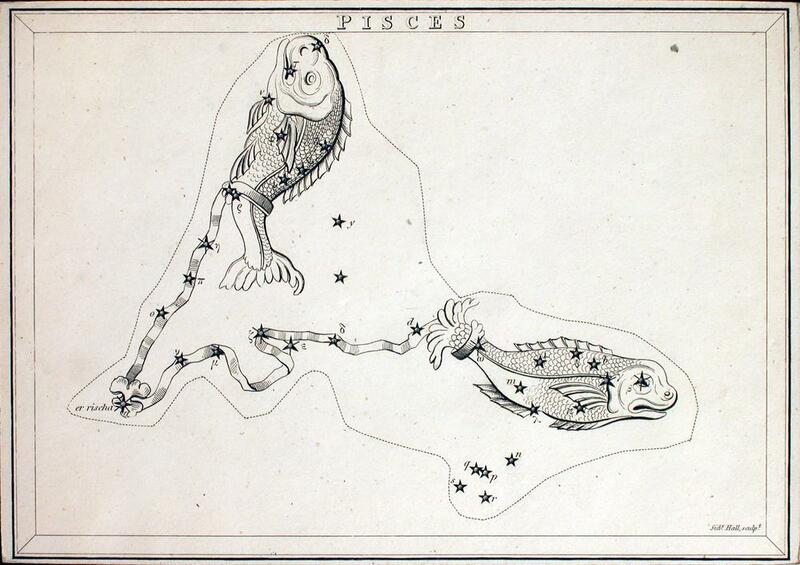 The idea of constellation cards with transparent stars was adopted by at least three other authors: Franz Niklaus König’s Atlas céleste of 1826; Himmels-Atlas in transparenten Karten by Friedrich Braun in 1850; and Otto Möllinger’s Himmelsatlas of 1851, although all these lack the artistic style of Urania’s Mirror. A second part of Urania’s Mirror, consisting of illustrations of the planets and an orrery among other delights, was promised in 1828 and again in 1829 but seems never to have appeared. Copyright notice: The scans on this page, and the larger versions to which they link, are © Ian Ridpath. You may use them for non-commercial and educational purposes provided appropriate credit is given. If you would like high-resolution files for reproduction, Adam Cuerden has cleaned up the scans from the US Library of Congress and posted them on Wikipedia.